Lewis Hamilton won a dramatic and enthralling Brazilian Grand Prix ahead of Nico Rosberg to take the battle for the championship down to the wire in Abu Dhabi. The driver of the day Max Verstappen stormed his way to a podium position from 16th, while Felipe Massa crashed out on his final home race in Interlagos. In a race of chaotic and immensely hazardous proportions, the incidents on a drenched circuit from relentless heavy rain were intermittent from the outset. Sebastian Vettel aquaplaned into a backwards position at Turn 14 - other cars darting through the spray out of his sight. Yet another two aquaplane constituted in costly incidents, as Marcus Ericsson's front left wheel detached to a limb after plummeting into the barrier and Kimi Raikonnen's race was halted earlier than anticipated when he crashed out on the start-finish straight. Precendently, both Daniel Ricciardo and Felipe Massa received five-second penalties in incidents involving the safety car and pitlane, respectively. Despite the frustrating frequency of safety cars and race suspensions, Lewis Hamilton's focus remained intact up throughout and The Brit was rarely troubled by his rival Rosberg or Max Verstappen - who had a sensational race in his own right. Felipe Massa crashed out of his final ever home race, but, despite the evident dismay of his beloved fans, a touching tribute followed as he sported his country's flag, waved to the crowd and further embraced with a rival team, his old team, current team and his family members in the pit lane. Obrigado, Felipe. At the restart Verstappen started 16th, however that failed to deter the 19-year old as he ruthlessly scorched through the field - brushing aside the likes of Vettel, Perez and Sainz en route to a tremendous 3rd place finish. Tremendously, that was subsequent to Verstappen also surviving a spin into the wall as he briefly lost control, but somehow transitioned his car back into the racing line. "My heartbeat went a bit there," said Verstappen on the team radio. 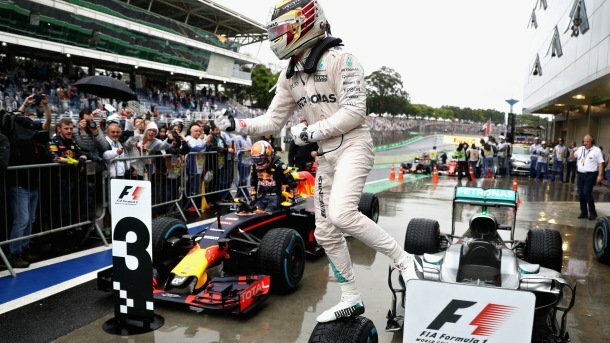 Hamilton's form in the lead spoke volumes; extending the already substantial distance between himself and Nico Rosberg, while Verstappen forced Vettel off the circuit at Turn 13 to The German's anger on the team radio, claiming he it was an unfair maneuver. Felipe Nasr scored two valuable, financially-boosting points for Saubers while Esteban Ocon narrowly missed out on a top ten position for Manor as he finished in 12th place. Unsurprisingly, he was a victim of Verstappen's earlier rampage. Top 10 finishes: 1. Lewis Hamilton 2. Nico Rosberg 3. Max Verstappen 4. Sergio Perez 5. Sebastian Vettel 6. Carlos Sainz 7. Nico Hulkenberg 8. Daniel Ricciardo 9. Felipe Nasr 10. Fernando Alonso. Remaining finishes and reitirments of the Brazilian Grand Prix: 11. Valtteri Bottas 12. Esteban Ocon 12. Daniil Kvyat 14. Kevin Magnussen 15. Pascal Wehrlein 16. Jenson Button, all followed by the earlier non-competitors, Esteban Gutierrez, Felipe Massa, Jolyn Palmer, Kimi Raikkonen, Marcus Ericsson and Romain Grosjean.